Vancouver, part of the fabulous west coast, offers a few very good day trips, they include the Vancouver Harbour, the Fraser River Estuary, English Bay and False Creek. For experienced and adventurous kayakers there's the crossing of Georgia Strait, from Tsawwassen to Galiano, a 19.3 km (12 mi.) paddle, the longer one is from Vancouver to Nanaimo. Minutes from down town Vancouver there are several excellent weekend kayaking trips you can experience. Indian Arm a classic coastal inlet is only minutes from the hustle and bustle of the city. You'll enjoy great B.C. mountain scenery as well as waterfalls and a few little islands. There can be plenty of water traffic in and around Deep Cove, Belcarra and Bedwell Bay. From Burrard Inlet to the Buntzen Power Plant you will find small beach communities, but after you leave Coldwell Beach touches of civilization are behind you. Continuing up the arm takes you by Silver Falls, Croker Island and the highlight of this trip, the multi-tiered Granite Falls. At high tide you can paddle up Indian River to enjoy some great fishing. Access: Launch at Deep Cove, only 9 km (5.6 mi.) east of Second Narrows Bridge in North Vancouver. Another place to launch is at Belcarra Bay, 28 km (17 mi.) east of Vancouver. Take Hastings Street and Barnet Highway to Port Moody, from here you just follow the signs to Belcarra. Trip time: Two to four days. Difficulty: This area is great for beginners and families as the waters are protected and usually calm. There can be a lot of small boat traffic, so watch for them and the boat waves. Season: Year round, but best from March to November, when it is less congested and more scenic. A kayak trip on Howe Sound means striking mountain scenery, a bird sanctuary, a seal colony, good hiking, good fishing and all close to Vancouver. 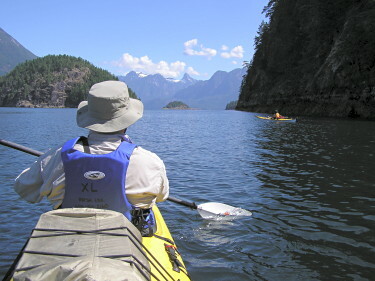 The best sea kayaking in Howe Sound is along Gambier and Anvil Islands, that are in the northern half. There's less traffic and more camp sites in this region. The launch from Porteau Cove means crossing the often choppy Montagu Channel, while the launch at Port Mellon is on the protected Thornborough Channel. Access: On the east side of Howe Sound, you can launch at Porteau Cove, a 26 km (16 mi.) drive north of Horseshoe Bay ferry terminal on Highway 99. If you wish to launch at Port Mellon, take the ferry from Horseshoe Bay to Langdale on the Sunshine Coast. On departing the ferry, turn right for 11 km (6.8 mi.) to Port Mellon. Difficulty: Good family and beginner sea kayaking area. Stay away from Queen Charlotte Channel, because of the water traffic and strong winds blowing south from the mountains can whip up dangerous waters. Always be very careful of traffic in parts of the sound, as Horseshoe is the ferry terminus for both Vancouver Island and the Sunshine Coast. Season: March to November, when it's less crowded and more scenic. The Sunshine Coast refers to an area stretching along the northeast shores of the Strait of Georgia from Gibsons to Powell River and Desolation Sound. As the Powell River region and the Sechelt Peninsula are separated by Jervis Inlet (and connected by BC Ferries), Powell River is known as the 'Upper' Sunshine Coast and the Sechelt Peninsula is known as the 'Lower' Sunshine Coast. The following information refers to Sechelt and Narrows Inlet. For information on other areas of the Sunshine Coast, please refer to Powell River, Desolation Sound, Lund, Jerivs Inlet, Sechelt or Gibsons. This area on the Sunshine Coast of B.C. is ideal for kayaking beginners who want to experience a fjord trip. This region offers abundant shellfish (oyster, crabs and clams), easily reached wilderness, tidal rapids and gorges. Leave all the urban trappings behind and head to Tuwanck Point. The beaches at Tuwanck Point, Skaiakos Point, Nine Mile Point, Halfway Beach, Kunechin Point and Islets are all designated provincial government recreational areas, so camping is allowed. The mountain peaks that tower over Sechelt Inlet can best be seen from Kunechin Islets and Point. The narrowest of all coastal inlets is Narrows Inlet and the most scenic spots along this trek is Tzonnie Narrows. It is best to paddle this area with favorable tide. Access: To reach the Sunshine Coast from Vancouver take the Horseshoe Bay Ferry to Langdale and from Vancouver Island, the ferry runs from Comox to Powell River. Sechelt is 28 km (17.4 mi.) north of langdale on Highway 101. From Sechelt, head to Porpoise Bay Provincial Park, the launch site is past the park entrance, just south of Tuwanck Point. The other launch point is at Egmont, at the northern end of Sechelt Inlet. This launch,, because of the Sechelt Rapids has to be traversed at slack tide and with extreme caution. Time Travel: From three to six days. Difficulty: The Sechelt and Narrows Inlets are excellent kayaking for beginners and families. Located on the Sunshine Coast, between Powell River and the Sechelt Peninsula, Jervis Inlet carves deep into the Coast Mountains of British Columbia. The snow capped mountains, the cascading waterfalls, the cliffs, the Indian pictographs, the glaciers and the wildlife makes this one of the best sea kayaking trips in B.C. To experience the best of Jervis Inlet, is to experience either the beginning or the end. At the mouth of Jervis, the outer islands provide interesting channels and bays and lagoons to poke around by sea kayak. These islands include Nelson Island, Hardy Islands and the smaller islands and islets of the area. A little further inland, Hotham Sound carves a deep tangent into the steep, glaciated mountains. With very warm waters, almost no wind, and the obvious draw of Freil Falls splashing down the mountainside from far above, Hotham Sound provides a unique sea kayaking experience. Heading deeper into Jervis Inlet is, perhaps, best done with the help of a motor vessel. Jervis Inlet itself can be a long, and often windy, paddling experience. However, once through Jervis Inlet, you arrive at Prince of Wales Reach, where the shoreline mountains seem to go straight up. Queens Reach is next, and finally you reach the cream of Pacific Coast inlets, Princess Louisa Inlet. You are now surrounded by superb scenery and quiet. At the head of the inlet is Chatterbox Falls and Princess Louisa Marine Park, a very popular spot with boaters in the summer. Access: Access to Jervis Inlet is either from the Sechelt Peninsula or north of Powell River. On the Sechelt Peninsula side, the three main launch sites are from Egmont, Earl's Cove or Irvines Landing. On the Powell River side, Saltery Bay acts as the main put-in for Jervis Inlet trips. All sites mentioned have advantages and disadvantages depending on where exactly paddlers are looking to go. It is recommended to contact a local sea kayak company to gain more specific information. Note that Saltery Bay and Egmont are connected by BC Ferries. Trip Time: Exploring the outer islands and Hotham Sound is best done in a 3-5 day trip. However, day or overnight trips are possible from any of the launch sites. If Princess Lousia Inlet is the destination, it may be worthwhile to look into a motor vessel transport from Egmont. Trip duration in this case may be 3-6 days, depending on whether or not the motor vessel transport is for both ways or just one way. Otherwise, if paddling up Jervis, consider taking six to twelve days, depending on how far inland you go. Difficulty: Experience is necessary. The inlet is long and narrow, so winds funnel up and down the length, and the rockwall coastline makes for difficult landings. Season: Anytime from April to October. Princess Louisa Inlet gets very busy in July and August, so you'll find May, June and September your best times. The scenery and warm protected waters teeming with marine wildlife make Desolation Sound one of the best sea kayaking areas on the B.C. coast. Visitors to this area enjoy meandering through the many inlets, channels, coves and bays as they explore by sea kayak. The towering mountains of the Coast Mountain Range create a dramatic backdrop, and the rich sunsets towards Vancouver Island light-up evening skies. With water temperatures reaching as high as 26C (79F), swimming is a popular option to the Desolation Sound experience. However, perhaps even more enticing than swimming is the opportunity for up-and-close experiences with the area's rich and colourful intertidal marine life. Snorkeling in Desolation Sound is wonderful. With Giant Sunflower Stars, Red Sea Urchins, prickly-looking Sea Cucumbers, spiny Rockfish, and so much more, snorkeling in Desolation is a highly recommended activity. Desolation Sound Marine Provincial Park is comprised of 5,666 hectares (14,000 acres) of forested upland and 2,570 hectares (6,350 acres) of foreshore and is one of British Columbia's largest marine parks. This, in combination with the areas adjacent to Desolation Sound, makes for one extremely large ocean playground. For many kayakers a trip to Desolation Sound includes paddling into the majestic mountains of the Redonda Islands and into Toba Inlet. For other more laid-back paddlers, paddling Desolation means including some downtime on the sandy beaches of Savary Island or meandering through the ragged islands of the Copeland Islands Marine Park, just off of Lund. For those with a little less time, the "backside" of Desolation Sound Marine Park includes Okeover, Malaspina, Lancelot and Theodosia Inlets, all beautiful and sheltered areas to explore by sea kayak. And, yet another option to include as part of the Desolation Sound experience is Cortes Island, its secluded lagoons and beautiful marine parks. Access: Located 30km's north of Powell River, on the Sunshine Coast, access to Desolation Sound is often through Powell River and then on to staging areas north of Powell River in either Lund or Okeover Inlet. Powell River is accessible by ferry from Vancouver (Horseshoe Bay) and from Vancouver Island (Comox). Another option to access Desolation Sound is via ferry from Campbell River to Quadra Island and then on to Cortes Island. From Cortes, launch sites are located at either Squirrel Cove or Cortes Bay. Trip Time: Day trips into Desolation Sound Marine Park can be experienced if launching from Okeover Inlet. Otherwise, most paddlers experience Desolation Sound over trips ranging from 3-6 days. For those seeking to fully experience Desolation Sound and the surrounding destinations, at least a week is optimal, if not longer. Difficulty: Waters here are mostly protected and rarely rough, except for Toba Inlet. Good family kayaking. Season: Anytime from March to October, like many other areas, it's busiest from mid-June to mid-September. This region is very distinct with isolated settlements. The scenery along Knight Inlet is hard to surpass, no matter where you travel. Both petroglyphs and pictographs can be found here, but the seas is very challenging. The inlet and channels are long and narrow, water can be wild and the tidal current and winds are definitely factors. Knight Inlet is for experienced, adventurous kayakers and suitable for one-way trips only. It is best to fly in and paddle out. Access: Drive to Kelsey Bay, north of Nanaimo on Highway 19, or drive further north to Port McNeill or Beaver Cove, where charter plane arrangements can be made. This will dictate your departure point. Trip Time: Anywhere from eight to twelve days, one way only. Difficulty: This paddle is for experienced sea kayakers, who are looking for adventure. Season: From March to October. Time you trip for the oolichan harvest in March and early April. Located in Barkley Sound, this archipelago of over 100 small but rocky islands is one of the most popular B.C. areas for sea kayaking. It's great for families and people that are new to the sport, therefore, can be crowded during July and August. Access the Broken Groups from Port Alberni by taking the passenger vessel M.V. Lady Rose directly to the Islands, a trip that takes three hours. Or you can launch from Toquart Bay which is a five miles paddle. Once you reach the Broken Group, you can make your way around the group by paddling from island to island, where you will find sandy beaches, protected anchorages and an abundance of both birds and marine wildlife. The Broken Group Islands is part of the Pacific Rim National Park and has eight designated camping areas where everyone must camp. Kayaking this area can take anywhere from three to ten days and can be best enjoyed during the off season. To reach Clayoquot Sound, take Highway 4 to Tofino on the west coast of Vancouver Island. Launch from the public wharf and be on your way to an outstanding sea kayaking trip. The most popular spot along this coast line is Hot Springs Cove. It is definitely worth a visit, just to soak in the warm and soothing springs. From Tofino to Hot Springs Cove you can paddle either side of Vargas and Flores Islands, depending on your sea kayaking capabilities. On your way, you will pass Meares Island, take time out to explore it. Both Vargas and Flores Islands have lovely sandy beaches. To explore this region it can take from six to twelve days, with beaches everywhere there is no camping problem. Other great sea kayaking spots off Vancouver Island include Nootka Island, Cape Scott to Brooks Peninsula, Johnstone Straits including Robson Bight and Blackfish Sound. Paddle along Nootka Sound either in canoe or kayak. Visit Crawfish Falls where Kelven Creek enters the Pacific Ocean. Admire the variety of inter-tidal life at Bajo Point. Then continue towards Yuquot (Friendly Cove). Wolves, sea otter, sea lions, black bears, cougars, and bald eagles can be spotted and viewed along Nootka Sound. Safety is very important and only very fit and experienced kayakers and canoers should attempt this or go with an experience guide. Learn more about Ocean kayaking and canoeing Nootka Sound. The Gulf Islands in the Strait of Georgia between Vancouver Island and the B.C. mainland attract kayakers from all parts of British Columbia, Canada and the world. This archipelago enjoys a mild, almost Mediterranean-type climate and is popular with people who enjoy outdoor recreational activities. There are more than 200 Gulf Islands, but most are small, uninhabited without facilities and ferry service. Only eight islands have permanent inhabitants, but its Saturna, Saltspring, North and South Pender, Mayne and Galiano that are well known and receive most of the visitors. The mild climate and protected waters, make the Gulf Islands the perfect kayaking destination. Kayaking means you can visit the smaller islands to enjoy the scenery, the tranquillity, and the marine wildlife. Tidal currents here are usually harmless, crossings from one island to another short, and you can always find a landing spot on a sandy beach. Watch for sudden winds. Narrow channels and steep shorelines can make winds gusty and dangerous. The best times to a kayak the Gulf Islands are mornings and evenings, and the best seasons are late summer and early fall. Active Pass and Porlier Pass should be avoided by unexperienced kayakers because of the strong and hazardous tides. The name Saltspring comes from the fourteen brine springs found on the north end of the island. Saltspring is the largest and most populated of the Gulf Islands with approximately 8,000 inhabitants. Its diversity includes mountains, cutthroat streams, trout and bass lakes and more than 600 km (370 mi.) of roads. Saltspring offers great hiking, fishing, kayaking, canoeing, beachcombing, and cycling. Easily reached by ferry from Vancouver Island and the mainland, sightseeing and enjoying the lay back life style attracts many visitors. This is a good starting point for kayaking trips to the outer islands, but first explore all the enjoyable kayaking Saltspring offers. The longest kayak trek is from Fulford Harbour to Musgrave Landing, which can take up to four hours. Most of this trip is in calm waters, but be careful around Isabella Point and at the beginning of the trip, as ferries from Swartz Bay and Fulford Harbour create swells. An interesting three hour cruise is around the Chains Islands in Ganges Harbour where there is plenty of marine wildlife. Mink, harbour seals and otters are common, and the seabirds include gulls, cormorants, diving ducks and black oyster catchers. Kayaking from Southey Point or Fernwood Point easily reaches Wallace Island, a B.C. marine park. The island has sheltered anchorages, beaches and grassy campsites. You can camp on the beaches or fields, but fires are not allowed. Use Wallace Island as a jumping off spot to tour the Secretary Islands, Hall, Reid, Norway and Jackscrew islands. Fulford Harbour to Jackson Rock is a pleasant paddling area with sandy beaches for quick anchorages should the winds come up. Jackson Rock, an islet has clear shallow waters, interesting beaches and should be visited at low tide. A cruise around Walker Hook, gives you an opportunity to look across Trincomali Channel to Galiano Island. Add mileage to this tour by going to the north end of Saltspring, paddle to Fernwood and around Southey Point. Paddlers use this most northerly tip as a launch point for trips on both sides of the island and to Idol Island. A trip along Long Harbour takes you to Scott Point, a popular bald eagle roost, so make sure your camera is handy. Across the harbour from Scott Point are a group of islets and some coves near the end of Nose Point a great place for a picnic and swimming. In a period of about two hours, you can paddle up and down Long Harbour with Prevost Island for protection from the southeasterly winds. Ganges Harbour on its own has excellent kayaking with coves and bays that can easily take up a weekend of exploring. Launch your kayak off Erskine Point in Stuart Channel for the trip to Vesuvius and Booth bays. Booth Bay is an interesting spot, because of the narrow inlet gap, it takes on pond-like atmosphere. Saltspring has several excellent anchorages for kayaks and other small crafts. Ganges Harbour has a sheltered government wharf and many protected anchorages. Long Harbour is a terminus for ferries, but Prevost Island, with major bays and inlets offers good anchorages. Temporary protection is available at Walter Hook, and there is a government wharf at Fernwood that provides very limited space. Both Wallace Island and the Secretary Islands have some good anchorages. Close to a store, motel, a restaurant and a neighbourhood pub is the government wharf at Vesuvius and the tiny coves behind Dock and Parminter points have anchorage. Booth Bay and Inlet offer protection from winds. Burgoyne Bay has some good temporary anchorage at the head of the bay and a small government wharf is near a booming ground. Private and government docks are in Musgrave Landing. Fulford a busy community has government wharves, Beaver Point is exposed to ferry wash, but behind Russell Island is a private retreat. North and South Pender Islands, with a permanent population of about two thousand, are known for their beaches and many bays. Unlike the other islands that ferries serve, the Penders shorelines are accessible by public right of ways. The islands are joined by a bridge over a canal between Bedwell and Browning harbours that they built in 1955. Like the other Gulf Islands, the Penders are home to many artists whose studios and galleries exhibit and sell their art work. A tour of the galleries is a great way to learn about the Penders and to take in the sites. Excellent kayaking, canoeing, hiking and biking make North and South Pender popular with the recreational crowd. The area between Port Washington and Wallace Point, a distance of 8.5 miles, offers interesting kayaking with numerous coves and islets to explore. The best part of this trip is between Stanley and Mouat points, which is only a four mile paddle. You can travel down the south side of the island to Boat Nook, but only if the weather is calm. If you wish to kayak farther down the south side, keep in mind, there are few places to land along The Oaks. Kayaking the northeast side of North Pender can start from either Colston Cove or Hope Bay and head to Hamilton Beach. Hope Bay also serves as a launching spot for trips around Plumper Sound, across Navy Channel to Mayne Island. Browning and Bedwell Harbours are both interesting and fun places to kayak. Start your trip in Browning Harbour at Hamilton Beach and follow the shoreline in the harbour and down the south side to Aldridge Point and Shark Cove. If the tide is right, make your way into Bedwell Harbour and Medicine Beach. Stay along the south shore from Medicine Beach to Peter Cove, an easy trip of 2.5 miles. From Peter Cove, head across the Bedwell Harbour entrance to Hay Point on South Pender. Paddle back to Browning Harbour along the shore of Beaumont Marine Park, around Ainslie Point and back through the canal. Bedwell Harbour is busy because nearby Beaumont Marine Park is popular with all types of boaters. And in summer there is a Canadian Customs Port of Entry for sea crafts at Bedwell Harbour. There's good moorage at Hyashi Cove, located on the north side of Otter Bay. Moorage can be found within Beaumont Marine park. Shark Cove has good anchorage, Browning Harbour has a government wharf and a marina for moorage. Hope Bay and Port Washington both have government wharfs. This long, narrow island is the second largest of the Gulf Islands and home to a population of approximately 950, that greatly increases during the summer and on weekends year round. The sandy beaches, sheltered harbours, relaxed atmosphere, art and craft galleries, small resorts, restaurants, lodges and bed and breakfasts make Galiano an attractive getaway. It is popular for fishing, hiking, mountain biking, sailing, scuba diving and kayaking. Kayaking Galiano Island means enjoying the offshore islets, islands and Montague Harbour Park. Montague Harbour is one of the busiest in the southern Gulf Islands and the park has a wharf and several mooring buoys. Many kayakers make Montague Harbour Park home base for paddling the surrounding area. There is a group of privately owned islands, including Parker Island that make for an easy two to three-hour circle trip. Paddle to Ballingall Islets where you can see double-crested cormorants and their unique nests sitting in the tops of the short Rocky Mountain juniper trees. Prevost Island, offer protected anchorages and is a three-mile trip across Trincomali Channel from Montague Harbour entrance. A good place to see harbour seals, sea lions, otters and eagles is at Retreat Cove, where you can enjoy a leisurely row. Launch your kayak at Whaler Bay and paddle the protected waters to Gossip Island, or make a trip around the island and nearby coves. Government wharfs are found at Sturdies Bay near the ferry terminal, at Whaler Bay, at Retreat Cove, Montague Harbour and North Galiano. Kayaking in and around the small offshore islands, the coves and bays on Galiano, is an excellent way to enjoy this attractive and tranquil part of B.C. This island of about 550 permanent residents is a mixture of old and new. The old dates back to the 1850, when gold was discovered on the Fraser River. Many making their way to the gold fields, stopped On Mayne Island in Miners Bay, because it was close to the half way point from Victoria to the mainland. The new are the modern subdivisions of Village Bay. Beautiful old mansions are next door to modern contemporary homes, it is an interesting mixture that gives the island character. The island has no provincial parks, but lovely beaches and majestic views of the ocean are inviting. Kayaking, fishing, hiking, community fairs and craft sales and theatre performances are all part of Mayne. A kayak trip between Village Bay and Dinner Point is a good shoreline paddle, but be careful of the wash from ferries travelling this area. In good weather, many continue kayaking down Navy Channel to Conconi Reef, Gallagher Bay or even Piggott Bay. Horton Bay with a government wharf is sheltered by Curlew Island, making it a safe spot for youngsters. Kayaking Robson Channel and the outside edge of Curlew Island is for more experienced persons, as there are some tidal currents. Bennett Bay can be your launching point for trips southeast to Horton Bay, northwest around Campbell Point to Campbell Bay and between Mayne and Saturna Islands. The mooring facilities at Village and Dinner Bays offer only temporary anchorage, as they are exposed to winds and ferry wash. Situated midway through Active Pass is Miners Bay, a busy community in summer and a government wharf with limited space. David Cove offers some safe anchorage. Campbell and Bennett Bays have temporary anchorage. Horton Bay has a government wharf with limited space. On the south side of the island, both Piggott and Gallagher Bays offer temporary anchorage. This Gulf Island is the most remote and least populated, but larger than Mayne or the Penders. It is mountainous with no public campgrounds and popular with day trippers. Saturna is a great destination for beach combers, hikers, mountain bikers, scuba divers, and kayakers. Fishing off East Point is popular with anglers because of the huge back eddy. The sheltered and open waters in and around the island offers paddling opportunities for kayakers. Winter Cove serves many kayakers as a starting point between Saturna and Mayne Islands. Launch from the parking area and cruise the waters between Winter Cove and Bennett Bay. Stay to the shoreline as you head into Georgeson Passage between Samuel and Lizard islands, continue your journey into Bennett Bay. On your return trip, paddle across Horton Bay, through the channels on the south side of Curlew and Lizard Islands and back to Winter Cove. An interesting trip is from Winter Cove through Boat Passage to a group of islets called Belle Chain. A favourite with all types of boaters is Cabbage Island, a marine park off Tumbo Island. From the launching spot at Winter Cove to Cabbage Island is approximately three miles. There is no water on the island, camping facilities are sparse, but it has sandy beaches that attract many campers. Boot Cove can be windy and wild, but makes for a good launching point around Trevor Island into Lyall Harbour. Head in the other directions and travel around Payne Point, across Breezy Bay to Croker Point. Lyall Harbour has a government wharf. Boot Cove in calm weather can be used for overnight anchorage. Breezy Bay is sheltered and offers anchorage. On the eastern end of Saturna, Bruce Bight, Narvaez Bay and Fiddlers Cove all offer temporary moorage. Winter Cove, is one of the most popular anchorages on Saturna Island and a provincial marine park. If you have unlimited leisure time and are an experienced kayaker the scenic inside passage can take from one to two months to paddle. There are many places of interest along the passage , such as Namu and Bella Bella. As you continue paddling north, you will pass by some of most spectacular scenery in British Columbia. Prince Rupert and area offers many interesting places to visit including the village of Kitkatla. This group of islands that are the most westerly land on British Columbia's coast offer sea kayakers trips that are unsurpassed. The uniqueness of these islands can be found in the rich shellfish beds, the sea bird population, the flora (there are species that grow no where else), the largest stands of red cedar, hemlock and spruce on the plant, and the ancient Haida culture. There are a few different paddling excursions you might consider. Starting at Queen Charlotte City, on Graham Island, a good seven to fourteen day paddle will take you down the east coast to Hot Spring Island, that looks out to Juan Perez Sound. Along the way there are good camping sites, but you need permission from the Indian Band in Skidgate to visit some of their reserves. This trip will take you by great mountain scenery, deserted settlements, totem poles, and colonies of sea birds and sea lions. The remoteness of this island is the greatest attraction, but getting to this part of the Queen Charlotte Islands can difficult. The return paddling trip can take up to three weeks, but you can make arrangements to hitch or charter a boat from Queen Charlotte City to Hot Spring Island, or you can charter a flight from Sandspit to Murchison Island. The kayak trip that starts from Hotspring Island takes you across the exposed Juan Perez Sound, to places like, Burnaby Island, Dolomite Narrows, Skincutte Inlet, Jedway and Ikeda Cove, Collison Bay, and Houston Stewart Channel. If you wish to visit Anthony Island you need permission from the Indian Band, the Parks Division and the caretaker who resides on the island. The highlight on Anthony Island and maybe the whole trip is a visit to Ninstints, a United Nations World Heritage Site, a now deserted Haida village, only the totem poles remain. No matter what the season, or what part of British Columbia waters you kayak, always check the weather forecast before heading out. Be prepared for the unexpected and never kayak alone.